This past Sunday, CrossPurpose officially opened its doors alongside Providence Bible Church. 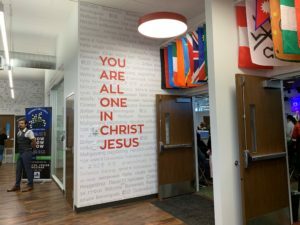 While classes for the non-profit have been going on for a couple weeks, the grand opening marked the official opening for the community. We joined in on the festivities to celebrate! Take a peek at the photos to see how the space turned out. The grand opening culminated years of growth and expansion for CrossPurpose and serves as an important milestone for the organization’s unique and important work of abolishing relational, economic, and spiritual poverty through career and community development in Denver. Aligned with its mission, CrossPurpose wanted to open a headquarters that was designed in community. The 56 walls display their values through quotations, verses, and custom community art. Chief Executive Officer Jason Janz and his team were intentional at all phases of the design process to feature diverse voices, input and leadership for the overall design aesthetic, layout and artwork. 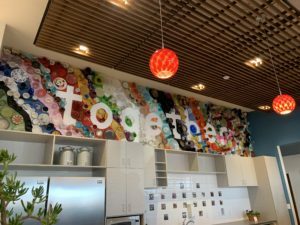 As a place-based organization, all of the art is from Denver-based artists. 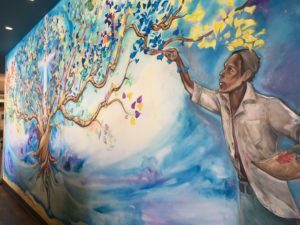 The new facility displays the art of inmates, historic residents, and children. 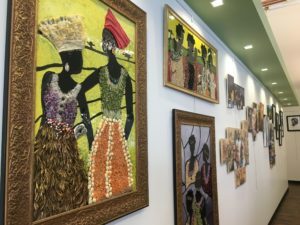 “We are thrilled to provide a place for the voices of our neighborhood artists to be seen and heard,” said Jason Janz, chief executive officer of CrossPurpose. On the construction side, this 16,000 square-foot, tenant improvement project included new glass-enclosed offices featuring all DIRTT systems, spacious classrooms, a community café, and airy sanctuary. Both café and sanctuary show off beautiful wood cloud ceiling elements. 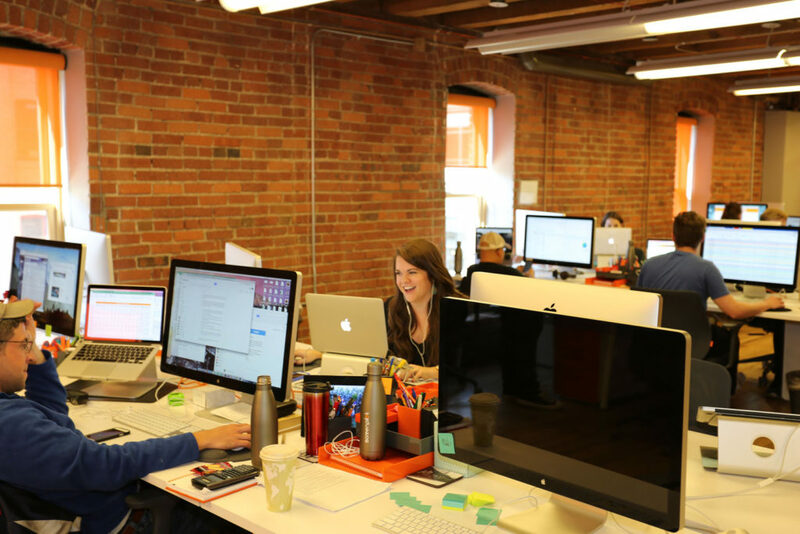 We love working with businesses and nonprofits alike who are dedicated to building up our Denver community. We’re looking forward to what great things are in store for CrossPurpose. Got something in the works? We’d love to know how we can help! Email us at info@snyderbuilding.com. Jake Dyck is no stranger to Snyder Building Construction, but since he’s wrapping up his first major project with us this month, we wanted you to meet him! Jake has been a leader in commercial construction for twenty seven years and holds a bachelor’s degree in construction management from East Tennessee State University. He started in the industry as a carpenter, working his way up and getting his bachelor’s degree. His repertoire spans from schools, retail and ground-up. Some of his past projects include Cherry Creek Middle School in Denver; Fire Stations #3 and #5 in Bartlett, TN; a The Church of Jesus Christ of Latter-day Saints in Tennessee; and a Dairy Queen in Denver, CO. Projects ranged from 4,000 square feet to 60,000 square feet. This month he’s finishing up a 28,000 square-foot, 100-year-old remodel on South Broadway in Englewood, Colorado. It’s had everything from major structural and HVAC upgrades to fine tile details. As a superintendent, he loves the challenge of maintaining a consistent schedule and finds metal building systems to be his favorite type of construction. In his free time, you’ll find him participating in fitness competitions and canine shows with his family and dogs. Building a happy bar requires the marriage of two important ideas: the overall vibe and the flow. This might just sound like today’s hipster mindset, but in all reality these two ideas are essential to the perfect bar. Think of vibe as the overall vision and concept, or how guests experience the space and place. And flow is all about functionality and efficiency for stronger service and, of course, increased sales. To understand what that means, we asked a couple of experts. Meet Kyle Duce (he owns Tap Station and Locol in West Seattle, while running Crafted Solutions, a hospitality F&B consulting company, here in Denver) and Loy Maierhauser (a Certified Cicerone, co-founder of Fermentana, LLC, and Tasting Room Manager at MAP Brewing Company in Montana). 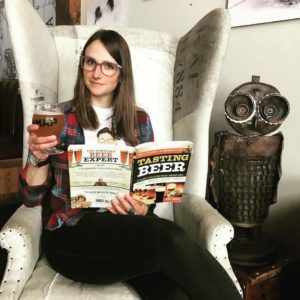 We sat down with these two and asked some pointed questions so you can have a head start in planning your own bar or brewery. At Snyder Building Construction, we typically build what’s already been drawn and developed, but understanding bar operations should be the starting place for designing (or redesigning) any new bar or brewery. And during the construction phase, we’re always there to help you build it better, find ways to save money, and keep the project on schedule. What should people consider when building a bar that would allow it to operate more smoothly? Kyle: More dry storage / liquor room space! Keeping back up items in an easily accessed storage room will help maintain the clean aesthetic and design of the original concept while allowing for bulk purchases that make a huge difference in bottom line profit. Loy: The bar’s physical design! I love the idea of seating around the whole bar, but you end up with a really challenging fishbowl effect. I know it’s nice to have the additional seating at our bar, but you end up with people trying to catch our bartenders’ attention from all directions, and it can be a bit challenging for them. We’ve definitely had to troubleshoot the flow issues. Keep in mind, many jurisdictions require liquor storage to be locked and any plan reviewers will want to understand where this storage is located. Overhead storage may have separate code requirements and fire, life/safety want to know storage won’t block any alarms or sprinkler heads. Consider also that cold beer likes to stay cold and wine is often temperature regulated. As such, plan carefully how you will store your canned/bottled beer and wine supply both behind the bar and in back-up storage. 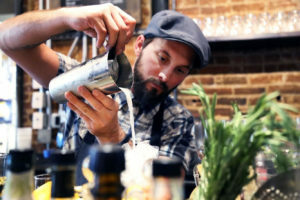 What are the top three keys to consider when building your new bar? 1. Clearly identify your concept and vision. 2. Never sacrifice functionality over aesthetics. 3. Flow of service behind the bar – set up wells to service guests fast and efficiently. Make sure high volume items are easily accessed and the draft system is centrally located. Have a dishwasher close to the service well. Create a work flow based off a busy night that’s efficient for bar staff to move and create a seamless night of service. 1. Vibe – What do you want people to FEEL when they walk in? What’s your ideal vibe? Build it. 2. Flow – How do you envision people moving through your space? For example, are you going to have a host, or let people wander in on their own? How are you going to let people know how to flow through your space? Signage, furniture, staff? 3. Logistics of your tap lines – This might be obvious, but long beer lines can be challenging to deal with. Long, glycol-chilled lines can still end up causing issues and can be tricky to troubleshoot. Typically, the shorter the line, the easier to deal with, and easier for your staff to change kegs and keep the flow of beer coming quickly on busy nights. All of these ideas center on planning and designing. Tap line logistics are huge! Shorter tap lines are absolutely easier and keep the beer colder overall. Tap lines aren’t just for beer anymore either. Consider also cold brew, wine, and sparkling water. Signage and furniture won’t go in until the end or even after construction – but many times signage and furniture have long lead times so you’ll likely want to get things ordered and settled at the beginning of construction. What questions do you for a contractor have about bar construction before you get started? Once the bar budget for fixtures and equipment are in place, what is the protocol if budget gets exceeded throughout the build out? Great question. We always recommend adding a 5% contingency line to your overall budget for this reason! But the heart of this question depends on a couple things. Was this an unforeseen condition or a change to the contract documents? If so, these additions typically move forward as change orders. How costs are managed depends on the agreement with your contractor. Have you set up a hard bid or negotiated job with them? Additional costs are always run by the owner first, however, some changes may be required your jurisdiction which would be required to earn a certificate of occupancy to open the business. Do you have a portfolio of previous bars & restaurants that you have completed? It’s always good to see the work the contractor has completed and what they are capable of. This is a great tip. Always ask about previous experience! Our team has run the gamut, from multi-million dollar brewery campuses to hole-in-the-wall, local joints. We’ve got local recommendations for everything from draft systems to bar tops to back-of-building delivery set-ups. What are realistic time frames for every major stage of the build out? How has that been met in the past with previous concepts? For projects roughly 2,500-5,000 SF in size you’re looking at about 12-14 weeks of construction time. You’ll want to add surveying, planning, architectural design and construction document drawings, permitting, etc… to get a true sense of your timeline. This could add anywhere from 8 to 12 weeks on the front end. Additionally, the exterior signage process has its own permitting and timeline process outside of the construction timeline through local zoning departments. The 12-14 week construction portion will run somewhat like this: 1-2 weeks for underground plumbing and electrical; 3 weeks for framing/MEP rough-ins; 3 weeks equipment installation/overhead work; 4-6 weeks for paint, tile, lighting, and finishes throughout. Note, permitting jurisdictions will not allow you to move in furniture or train staff in the space until a health inspection and final building inspections are completed. Consider this timing when building out your opening operations plan! What are your biggest lessons learned from bar set-up / construction? Kyle: Never cut costs on the importance of good materials and equipment that will withstand the high volume of wear and tear. Consider a durable bar top, reliable refrigeration, and quality draft system. Also, create a highly detailed budget and be prepared to make cuts within the budget, having backup finishes and fixtures in place if needed. Loy: Get some experienced bartenders and servers in to look at your plans and building. Even if builders or owners have some experience in the industry, it’s typically years in the past, and having the people who will ACTUALLY be moving through your space look at it and help you troubleshoot things and generate ideas will be invaluable. We agree! Partnering with industry folks who have been down this road is the best way to go. They can help you get started on the right foot and follow you through to the end. Read part I of the series: The Nuts and Bolts of Building a Restaurant: A Guide for New Owners. Ready to learn more and get to work with us? Email info@snyderbuilding.com or call us at 720.900.5082. 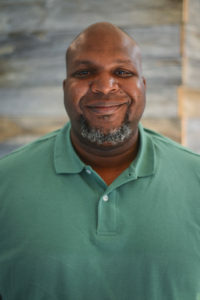 We’re thrilled to bring on Johnny Jones as our newest superintendent! He’s already hit the ground running with our retail and restaurant sector. Johnny started his career in construction in his late teens. 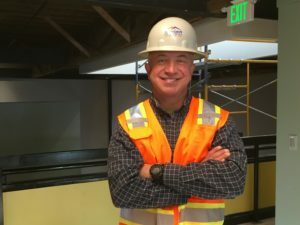 He’s worked in everything from tenant finish to ground up with stints in carpentry and worked his way up to be a superintendent, a position he’s now held for nearly 12 years. His hard work doesn’t go unnoticed as he’s received Project Safety Awards from the Denver Justice Center and Project Performance Awards from the Denver News Agency building. He loves working with subcontractors, building a plan, and seeing it come through to fruition. Past projects include Cradles to Crayons, Huntington Learning Center, Andy’s Frozen Custard, Cheers Liquor Mart, and a large, pharmaceutical-grade commercial kitchen. Johnny is a Denver native and graduate of East High School. He’s played semi-pro arena football and coached local little league for nearly ten years. 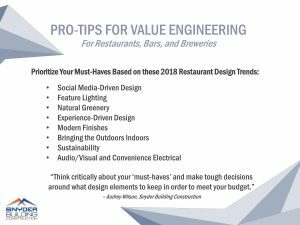 Your Budget Will Thank Us — 8 Design Trends to Consider When Value Engineering | Part III: Bars, Restaurants, and Breweries, Oh my! With the infrastructure engineered and a strong team and plan in place, it’s time to talk interiors and finishes. In their semi-state-of-the-union, Architectural Digest notes 2018 restaurant design continues trending toward Instagrammable, well-lit spaces that incorporate natural greenery. Alvarez-Diaz and Villalon add that experience-driven design will also reign. 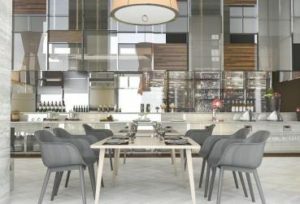 “There is a shift in restaurant atmosphere, from cozy and rugged to clean and modern. Expect more green in the form of plants and living walls, adding life and comfort,” says Rachael Lyman of Studio Atlantis. In addition to plants, sustainability will continue to be a “green” focus. When it comes to saving money during construction, it boils down to two things: (1) plan your best ahead of time; and (2) value engineering, meaning to think critically about your “must-haves” and make tough decisions around what design elements to keep in order to meet your budget. Do the planning up front and then let the design play out. As a general rule of thumb, design changes in the field can cost up to 3x more than making design decisions at the early stages—this is due to plan revisions, time lost, lead times, and extra project management time. There’s no doubt you’ll end up spending a lot of your budget is on kitchen equipment, any “wet” areas of the restaurant including restrooms, lighting packages, and infrastructure upgrades (mechanical, electrical, plumbing). In the sections below, we look at a few areas of consideration and dive into some 2018 restaurant design trends to discuss what’s happening and identify areas of cost savings (a.k.a. value engineering or ‘VE’). If you missed Part I of the conversation, check out the Nuts & Bolts of building a restaurant here. Whether you’re building a franchise brand or a local owner/operated concept, brands have to be unique to distinguish themselves. How brands connect to their consumers these days is intrinsically tied to their social media conversation. With your physical store presence, you have to weigh the options of spending more to have a unique brand experience (i.e. a unique Instagram/Snapchat moment) or spending less for a simpler look. When it comes to construction, custom items such as art, fixtures, furniture and features will most likely be more expensive than what you can find off the shelf. Trends shift quickly, so be prepared for an interiors update as soon as five years to keep up with the changes. VE Option: Keep the structural/built design elements classic or simple. As design trends shift, furnishings are easier than structural/architectural elements to change. Choose the number of custom features carefully—custom work is almost always more expensive. The lighting package and associated electrical work will be a high-priced ticket item during your construction build out. Long lead times for light fixtures may make it tough to keep on schedule without proper planning with your design and construction team. We recommend deciding on your lighting package early so that material can be ordered as quickly as possible which is your best hope at keeping this activity line on schedule. Added days to the schedule = increased cost. Certain lighting is required by code. To meet code requirements in Denver, you must plan to reduce overall lighting power consumption by using enhanced lighting controls. This means drawing less power altogether via LED fixtures or changing out light switches to an occupancy sensor switch. In some cases, a fully integrated, lighting-control panel may also be required by the local jurisdiction. Another typical health department requirement is task lighting behind and underneath the bar for employee visibility. Consider that track lighting offers flexibility in pointing light where you want it to go (accent walls, highlighting art, etc.) and is great for open ceiling plans. Recessed lighting works well for drywall hard lid or acoustical tile ceilings. VE Options: Choose less expensive ambient lighting and spend your lighting dollars for accent/feature lighting. Choose less expensive fixtures in the back of the house and focus on making impact in guest areas. Having plants in a space can improve ambiance and mood. Consider, however, that with live greenery it’s imperative to maintain and water them to keep plans looking healthy and great. Plant maintenance will add monthly costs, something to think about before you add them into your design. Adding plants to your restaurant can happen before or after the build out depending on the application within the design. Examples include built-in planters, live green walls, etc. Will plants be hung from the ceiling? If so, how will they be hung? Are you choosing indoor or outdoor planters? If you plan to incorporate greenery into fixed design elements, consider drainage plans, non-porous materials, access for maintenance, ability to provide watering, and proximity to food production to avoid cross contamination. Jeff Sheppard of Roth Sheppard Architects in Denver gave a talk earlier this year at the Colorado Real Estate Journal’s conference about the importance of experience-driven design. To drive home his point, Sheppard talked about how “airports are the new mall” and how self-service kiosks in restaurants and retail are also becoming more and more prevalent. When you look around, you see some local chefs already driving this experience innovation. Take Five Point’s Birdcall with iPad order kiosks and only a few service staff. And First Draft Taproom & Kitchen where guests pour their own beer and are charged by the ounce. Self-service sparkling water is on the rise as well. All of these experience-driven design choices require intentional storage, electrical, plumbing, and service flow planning. While you will spend money on building for these, you could save on labor costs once open. Picking appropriate finishes means choosing what meets the budget, fits the design, and serves its purpose for a long time. Right now, 2018 predictions are bringing back wood and white for a light, open-airy feeling. Along with this, we may see a shift in the decision to use finished concrete as the floor option. Floor tile can be a great alternative to finished concrete and has an incredibly wide-range of possibilities. Be cautious in your choices, as tile cost varies widely and can have long lead times, especially if shipped from overseas. Picking finishes that look great and stand up to the commercial, high-volume traffic matters. “Don’t skimp on the quality of the kitchen floor. It costs you more up front but saves you money in the end,” says Rich Snyder, Owner of Snyder Building Construction. The back of the house gets heavy use with foot traffic, deliveries, dirt, and grease grime. It’s easier to spend more money up front for an easy to maintain and durable floor. Patching and repairing down the line is costly and disturbs your business. Further, patches may not always match the original quality. Some common floor finish choices include, finished concrete, epoxy flooring, and quarry tile. Polished concrete is the least expensive, but it’s porous so can stain, will easily break a dropped dish, and is hard on the human body after standing all day. Some local health departments will not allow concrete treatments, so check with your design team if this is a floor you’re considering. Quarry tile is mid-range in terms of price and is very durable, but not as attractive. Epoxy flooring costs a bit more, but can accomplish the goals of looking great, reducing smallware breakage, and increased employee comfort despite all-day standing. In wet areas of the restaurant (like bar and back of house), another material consideration is stainless steel. Plastic laminate or other less expensive options won’t hold up to the constant wear and tear. Stainless steel kitchen sinks and fixtures can come in a wide range of pricing and it can be tempting to go for the most expensive “Cadillac” equipment package, but it is not always necessary. You can save money by picking less expensive brands because stainless steel equipment and sinks typically utilitarian pieces of equipment. Unless you’re considering an open kitchen, you don’t need to choose the most expensive. All that said, equipment that offers better sustainability in terms of energy or water use typically cost more up front but save you in costs years down the line—and are better for the environment. If sustainability is a priority for you, it may be worth the extra money to invest in this type of equipment. Welcome Spring! Which means it’s time for patios, roof tops, open windows, and door rollups. Read on for tips on these design options to make sure you’ve planned for everything. Roof Top Patios – Structures must support the weight of a specific live load to be used for occupancy. Check with your engineers and building owner/landlord if applicable! Outdoor Ground Patios – Code requires at least 5’ of clearance around the patio for pedestrian travel. You’ll need a handrail or demarcation line around the patio for exterior alcohol service (and an approved liquor license). Overhead Doors – Because overhead and rollup doors breach the inside and outside and require building into the walls of the building, negotiate with the landlord as to whether this is a landlord provided item or tenant provided. Additionally, there are special code requirements regarding clearance to travel and fire suppression lines above and below the track. Did you know that when furniture for the US is made, the wood is typically harvested in North America, is usually shipped overseas for production and fabrication, and then shipped back to sell in the U.S.? The amount of fossil fuels and energy required for that intercontinental supply chain isn’t sustainable. Housefish, a Denver-based furniture manufacturer hopes to change that by sourcing local materials and making furniture in the city. Other ways to incorporate sustainability into your restaurant include LED lighting, sourcing local, energy-efficient equipment, and planning for dimmers/controls. Dimmers and controls are great in a restaurant setting because they allow you to change the mood and lighting based on time of day. Divided, rough-use bins are also a strong idea. LarkBurger is a front runner on this idea who feature built-in bins divided for trash, mixed recycling, and compost. The company composts 100% of its packaging when commercially available. You’ll need to plan for service pick-ups to make sure recycling compost is disposed of properly once it leaves your facility. While this wasn’t pointed out as a 2018 trend in our research, these are must-haves in our digital world. Convenience outlets and USB ports are integral these days. Further, consider the flexibility of your sound system and are you streaming radio/music? How’s your internet connection and Wifi? Is it public wifi? If you are streaming music, you will want to make sure your internet connection is strong. Can you put outlets on the guest side of the bar for phone charging and sometimes laptop work? Lastly, it’s never fun if an electrical circuit gets tripped. Make sure your point of sale kiosks are each on a dedicated circuit so that if the inevitable happens, not all of them cut off altogether. Redundancy will save the day! You can’t move in furniture or train staff in the space until a passing health inspection and TCO is acquired. Not following this rule can be detrimental to your move in. Denver has an ordinance that all single-stall bathrooms are to be built as gender neutral. Save yourself stress and partner with an experienced food-service architect and general contractor. You will save time because there are unique rules regarding floor drains, sanitization stations, finish specifications, etc. that these partners can help with. Do the planning up front and let the design play out. Design changes in the field can cost up to 3x more than making design choices at the early stages due to plan revisions, time lost, lead times, extra project management time. Ready for more? Contact Snyder Building Construction for concept budget pricing or support on building your restaurant at info@snyderbuilding.com or 720.900.5082. Meet our Newest Senior Project Manager, Matt Redick! We’re excited to announce Matt Redick has been hired as a Senior Project Manager to support restaurant and retail construction. 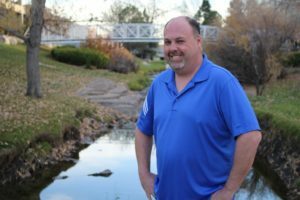 He joins Snyder Building Construction with nearly 20 years of construction experience, serving his whole career in the Colorado and Denver general contracting markets. While based locally, his background includes dozens of national brands including Foot Locker, Marriot Resorts, Massage Envy, The Limited, Pizza Hut, Rocky Mountain Chocolate Factory, Bad Daddy’s Burger Bar, and Sunrise Assisted Living. Locally, he’s worked as a project manager for general contractors on YogaPod, Domino’s, and Beast and Bottle. His specialty areas include restaurant and retail tenant improvement and new builds. Having spent nine years in the restaurant industry, he brings a unique perspective from the operations side to identify potential problems with layout, restaurant equipment, and kitchen efficiency. snowy months, and singing karaoke. We’ve been building tenant improvements for a while now. And while we feel pretty strong we know the order of things, the real story is the experience from the client’s perspective. After all, a tenant improvement indicates some type of shift for their business, generally a move toward growth or new experiences–these are moments of celebration! As a general contractor, our hope is to make the transition seamless, so tenants can focus on their own priorities. However, how do we really know if we are on the right track? What is it like from the client’s perspective? How else can we be preparing and supporting our clients? For fresh perspective, we decided to unveil the other side of the story. Clients Tom and Becky Dibble of Screen Pilot, graciously agreed to talk with us about their tenant improvement experience. 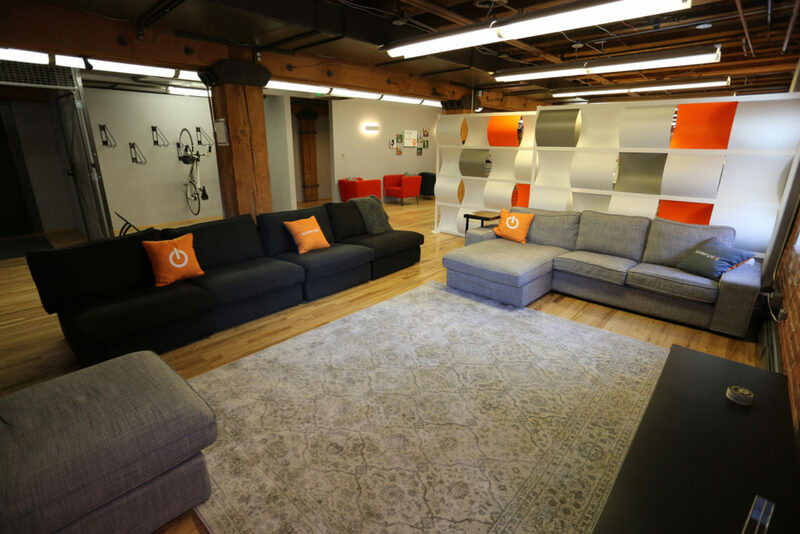 Their hospitality-focused marketing agency recently expanded into an entire floor of a historic building in Downtown Denver and hired us for general contracting. Snyder Building Construction (SBC): Before we dive into your direct experience with the expansion construction, thank you! We had a great time building your new space. We’d love to know more about what takes place inside these walls. Tell us more about Screen Pilot. 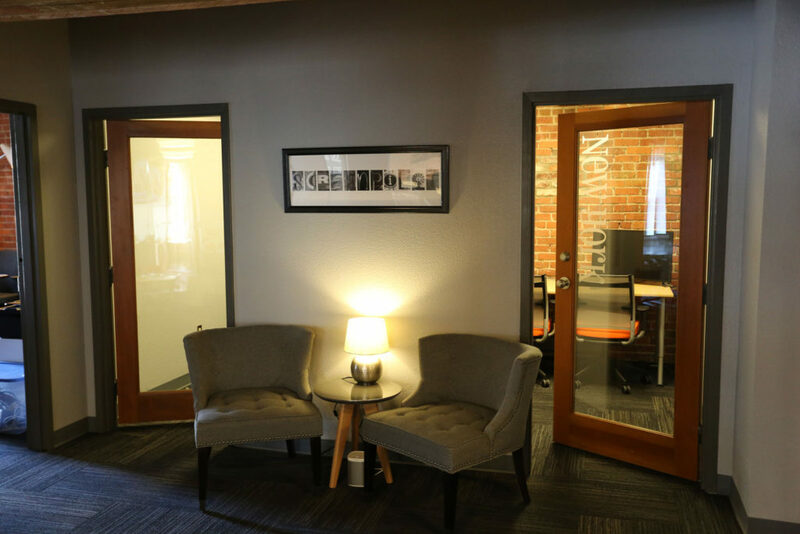 Screen Pilot – Becky: We started as a small consulting firm, operating out of a home office, to now, a 20-person, thriving agency who continue to grow their client base. We built Screen Pilot on the desire to create a digital marketing agency that could deliver engaging and enviable client experience with pride and commitment. SBC: You picked Denver over London, your hometown—I love it. Becky: Yes, our roots are firmly in the Mile High City, although we’d like to think an office in London is a possibility, in our future! SBC: Clearly, the expansion means you’re growing and needed more space. Why expand in a historic building rather than go somewhere new? Screen Pilot – Tom: Expanding as the only tenant on this floor meant more privacy and a sense of growth that we are experiencing not only in head count but as a business overall. Downtown Denver is burgeoning with new builds left, right and center, and it’s an amazing location on LoDo, we wanted to stay in the thick of it all. SBC: And you really are so close to everything. 16th street mall, Union Station, some of the most amazing Denver restaurants—having met your team this choice absolutely fits the vibe at Screen Pilot. On the inside, how did you prioritize team needs and decide the floor plan layout? Tom: We wanted to create a much more open plan space and sectioned off private meeting rooms for client meetings and internal meetings. That way we could accomplish both sense of privacy and collaboration. SBC: It seems like the finished outcome definitely accomplishes what you were hoping for. On a random note, we were curious, did you have any previous experience with the commercial tenant improvement process? Tom: When taking the lease in the first place, our initial experience with commercial construction was limited to what the landlord was managing. So very little. On a commercial basis, we had no experience working with a general contractor. SBC: No way—y’all asked all the right questions! I would have never known. When you started the process, what kind of relationship did you hope to have with your GC? And what were your priorities during the construction process? Tom: Trust was paramount. If you can’t trust your GC, you may as well do it yourself! We also wanted to mitigate noise for both the commercial and residential tenants in our mixed-use building, but also get the job done to plan, on-time and on budget. SBC: We couldn’t have said it any better. Trust allows the project to move together smoothly and allows for more conscious decision making when discrepancies arise. This kind of relationship ultimately leads to on-time, on-budget projects. The construction experience from the perspective of other people and businesses is obviously crucial in a historic, mixed-use building like yours. Commercial tenants are working during the day and families are at home early in the morning and in the evenings. SBC: Were there any surprises during the process? Tom: Not really surprises as such, but that’s not a bad thing! Becky: During the demo phase, pipes and strange electrical wirings were exposed, not a huge surprise due to renovating a building of its age. Thankfully, a quick call from our GC meant an effective and satisfactory outcome so the project was not delayed. In the end, we had to know how we did overall—the good, the bad, and the ugly. “At the start of our construction project, the whole team helped pack up our existing office and we all headed home to work. Our company thrives on teamwork and collaboration, so getting back together within the same space as soon as possible was paramount. SBC ensured this happened as efficiently as the project allowed,” said Becky. Ultimately, their trust in us made for a great relationship and project experience. We had no idea Becky and Tom were unexperienced in commercial construction. They were always so confident and asking great questions. 2. Your general contractor’s attention to detail, communication, and level of organization will either help put you at ease or add stress to the transition. 3. Plan your space to include multiple work environments for varied tasks. Think about open space, private conference or work rooms, and relaxing/collaboration areas. Thank you to Tom and Becky for trusting us to build your downtown space and for your continued partnership. We look forward to continue watching Screen Pilot grow! Screen Pilot is a Denver-based, digital marketing agency that specializes in telling the stories of hotels, resorts and hospitality brands through inspired communication. Learn more at www.screenpilot.com. 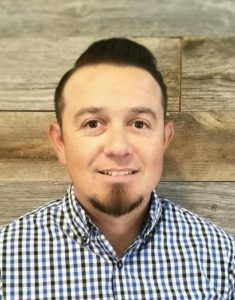 We are excited to share we’ve brought on Tristan Harmon as our newest superintendent for commercial tenant improvement and new build projects. 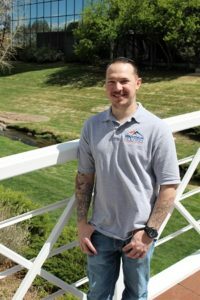 Starting as an Army general construction supervisor, Tristan has more than a decade of experience in the field and a natural ability to build relationships with subcontractors and owners. We agree! Welcome to the team, Tristan. His specialties include electrical wiring, subcontractor relations, cost/schedule control, and detailed plan analysis. His most recent role was serving as assistant superintendent for a new $325M, 400,000-square-foot building at Denver Health Hospital in Denver, Colorado.